A new way of identifying metal and explosives could provide a valuable tool in the fight against terrorism. Airport security has become big business following the terrorist attacks in the US. A system that detects both metal and non-metallic weapons using terahertz light has been developed by technology firm TeraView. It could make passenger screening at airports more effective and quicker, say experts. Dr Ruth Woodward, an independent scientific adviser for terahertz consultancy firm HT Consultants, said the technology could provide one of the most innovative ways of dealing with security threats. "It presents a positive step forward, although the economic benefits are yet to be determined," she told BBC News Online. Terahertz light sits between microwave and infrared on the electro-magnetic spectrum. It has a number of properties that can be harnessed to screen passengers. Unlike X-ray, it is perfectly safe to use on people. 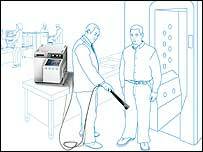 It can pass through clothing, paper and plastics to detect metal, ceramic or plastic weapons. And it can identify explosives by reading their characteristic spectral "fingerprints". TeraView is a firm looking at ways of exploiting terahertz light. It is developing a handheld security "wand" that could be used by airport security guards to pass over the body of passengers. It is expected that the product will be available for commercial use within two years, following a trial at an as yet unspecified airport. The firm is in partnership with detection equipment firm Smiths Detection on the project. The terahertz wand will be attached to a box which will bleep when suspicious objects are found. Eventually the firm also hopes to make a walk-through portal that uses the same techniques as the wand to scan passengers. "The big challenge for airports is to keep the passengers happy and provide a high level of security," said Dr Mike Kemp, the vice-president of TeraView. "What we are trying to do with terahertz light is create something that is more automatic and reduces the dependence on the sharp-eyed operator," he said. The technology is not likely to replace current methods of scanning, rather will sit alongside them, he explained. And there is no substitute for old-fashioned human alertness. "Any technology, whether it is new or old, is only there to complement commonsense," said Dr Woodward. Following the September 11 attacks, airport security has taken on a new-found urgency. "Many companies are looking at new technologies that can offer substantially increased security," said Chris Yates, aviation security editor at Jane's Transport. 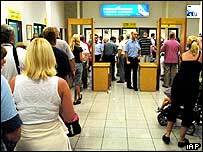 A system that blows air at passengers to detect explosives is under trial at Terminal One of Manchester airport. And several US airports are testing technology that can virtually undress passengers to detect any suspicious items. This has caused uproar from civil liberty organisations in the US and led to some modification to allow passengers a degree of modesty. "Basically the most sensitive areas of the body have been blocked out," said Mr Yates. Terahertz light is regarded as the last unexplored frontier of the radio wave and light spectrum, and can also be used in a variety of ways such as medical imaging.